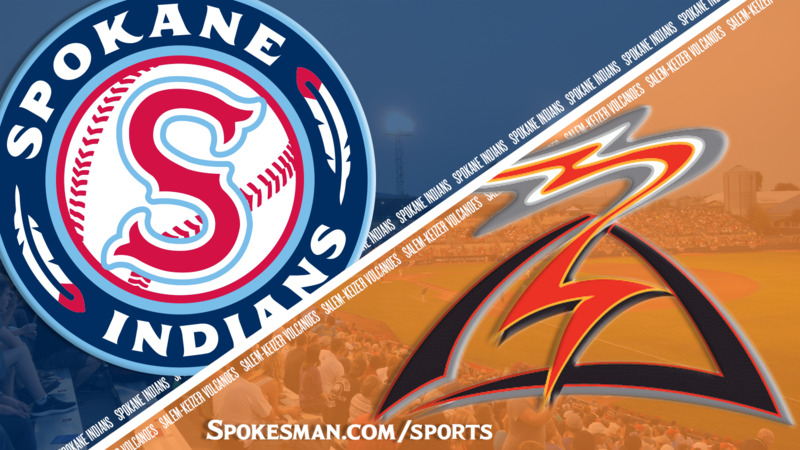 KEIZER, Ore. – Hans Crouse wasn’t as sharp as his last start, but the offense pounded out 14 hits and the Spokane Indians beat the Salem-Keizer Volcanoes 7-5 in the first of a five-game Northwest League series at Volcanoes Stadium on Thursday. The Indians remain three games behind Everett in the North Division with four games left in the first half. J.P. Martinez went 2 for 5 with a homer and three RBIs. It was his fifth multihit game in his last 10 games. Crouse (3-1, 2.77) twirled a gem last Friday, holding Eugene to one hit and no walks with 11 strikeouts over seven shutout innings, which earned him NWL pitcher of the week honors. Against Salem-Keizer, the hottest-hitting team in the NWL, Crouse allowed four runs (three earned) on six hits and two walks in 5 2/3 innings. The tall righty struck out three, his lowest output for a start lasting at least five innings. The Indians (15-19) got off to a rough start – at least on defense. Volcanoes leadoff hitter Jose Layer skied a fly ball behind first base. Second baseman Jax Biggers called for it but then lost it and it fell safely for a double. Layer advanced on a flyout and scored when Crouse dropped a popup for an error. Tyler Depreta-Johnson’s third-inning single plated Tanner Gardner and tied it at 1. Curtis Terry led off the fourth with a single and went to second on Jonah McReynolds’ one-out single. Isaias Quiroz doubled to left and Terry scored easily, but McReynolds was thrown out at the plate. Gardner singled, but Quiroz was nailed at the plate by right fielder Mikey Edie for the second out at home in the inning. Starling Joseph led off the fifth with a double and Depreta-Johnson walked. Biggers reached on a bunt and Martinez singled to right to plate two runs and put runners at the corners. Martinez stole second and sacrifice flies by Terry and Diosbel Arias made it 6-1. In the bottom of the fifth, Nico Giarratano punished a mistake by Crouse for a two-run homer, his second of the season. Crouse got two outs in the sixth but allowed two more base runners. Sean Chandler entered and was immediately greeted by an RBI single by Giarratano to make it 6-4. Martinez got that one back with a one-out solo homer in the seventh, his fifth of the campaign. Three consecutive singles loaded the bases but the Indians left them stranded. The Volcanoes (17-17) made it 7-5 in the bottom on an RBI double by David Villar. Published: July 19, 2018, 10:10 p.m. Updated: July 19, 2018, 10:36 p.m.